The rehabilitation of King’s Cross in central London continues apace. It almost seems as if every other day the scaffolding comes off yet another fancy office building, boutique, home or restaurant in the ambitious 67 acre project. The new kid on the block is The Lighterman. 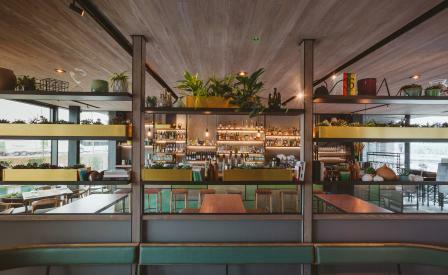 The third tasty offering from Open House – the group behind Percy & Founders, and The Larder – the three-storey restaurant is named after the Victorian drivers of the ‘lighter’ goods barges that once plied London’s waterways. The solidly handsome brick façade by architects Stanton Williams mirrors the historic Granary Building across the square. In a way, the uniform anonymity of the exterior is a boon because the interiors provide a studied contrast of raw pale timber floors, exposed concrete and bare brickwork with burnished metal table tops and gold trim. Meanwhile, a scattering of photographs is a nod to the area’s industrial history and transportation. All of which is a rugged setting for executive chef Diego Cardoso’s robust all-day menu of British classics (ham hock and leek pie, anyone?) and grilled steaks, with a judicious lashing of mod Euro plates like cured trout and spiced mayonnaise, and salt-baked beets with watercress and feta. And if summer ever arrives in the capital, the three alfresco terraces are ideal for tossing back sours and mint juleps.